Taliban fighters have invaded the city of Kunduz once again, according to multiple online sources. Just over one year ago, in late September 2015, the Taliban seized Kunduz and briefly held it before being driven back. But the Taliban has retained a presence in the surrounding areas ever since and launched another assault on the center of Kunduz earlier today. The Taliban’s push into Kunduz was first trumpeted on a Twitter account attributed to the group’s spokesman, Zabihulla Mujahid. Some of the tweets can be seen below. 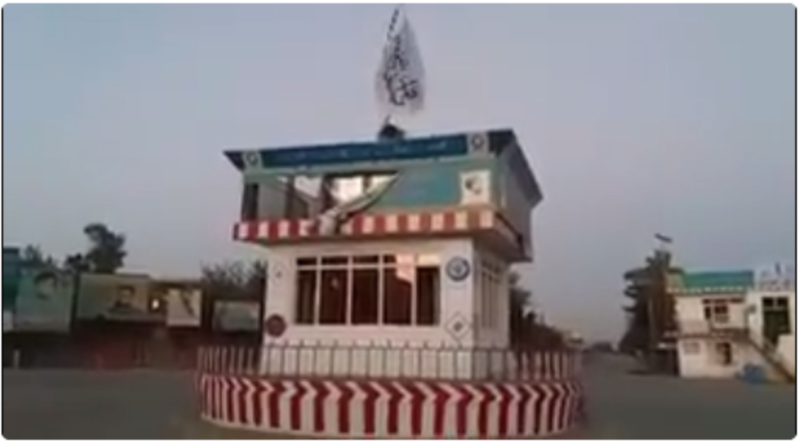 The propaganda feed reported that Police District #2 (“PD2”) and a recruiting center for Afghan forces were “overrun” during the offensive. The Taliban’s fighters then moved into the city’s “main intersection” while also attacking the governor’s compound and a police headquarters. A short video shows a jihadist hoisting the Taliban’s white flag above a small building in the city’s “main” traffic intersection. A screen shot from the video can be seen above. It remains to be seen if the Taliban can maintain its presence inside the city’s center this time. Last year, the Taliban was ejected from Kunduz after approximately two weeks. Still, the temporary fall of Kunduz in 2015 was an ominous sign, as it was the first major urban area to be recaptured by the Taliban since 2001. Still other jihadist groups that recruit from central Asia have likely bolstered the Taliban’s ranks in Kunduz as well. The Pakistan ISI created the Taliban with the blessings of the Americans, who then forced them into a tactical retreat, not defeat, then wanted them at the table for talks, and now the same Yanks look foolish in the eyes of the world – defeated, wretched, broke economically and totally without a foreign policy that would appear or make sense to a sane person. I read that they were beaten back already? I don’t really understand their strategy of trying to capture Kunduz. Yes, it’s a major pr blow, but the state of Afghanistan and the NATO allies can never ally the Taliban to maintain a presence in the city. While they’re not interested in fighting them in the outward districts, they’ll surely fight hard to eject them from one of the largest cities in Afghanistan. The point is the Taliban has access to the people. The Army, the police, cannot at all stop them. Government workers, Families of Police, anyone having had recieved a night letter now in Kunduz-they know exactly what this means. This is how they wind up in Germany. I find it alarming that the Taliban can mass these forces around a city this size, and the local constables have no intelligence of it. Even during the anniversary of last years attack (everyone KNOWS the Taliban LOVE anniversaries) .where’s all this training we provide go to? I’m sure the locals will be back with something to remedy the situation. But what if they don’t? Money plus money equals training operation. Training operation plus Afghan rentier state corruption equals a big fat zero. Now you can surge this and go in deeper and you can wind up with 2 or 3 or 4 times zero. It’s all a huge zero and a waste of lives and money. The keywords are ZERO and WASTE. Let the Afghans learn to fly their new donkeys. It’s time to announce ‘last call’ and start to pack’n. Taliban know they cannot hold a city center at the moment. So they do raids to let everyone know they are still in the game and wont let anyone relax. They are waiting for the perfect time to attack and hold big cities. They are testing them with raids, and soon they will do coordinated attacks on all cities. It will be a blitzkreig like when they first came to power. Might be today, tomorrow or any years. As the taliban once said, ” US and allies have the watch, but we have the time. Also little does anyone know that the taliban have probably couple tens of thousands as an active fighting force but probably millions if not hundreds of thousands as reservists. They are locates on the tribal belt and border areas, and this is what they will use to plan their blitz. You are welcome for the information. The USA has badly failed in afghanistan. Now they will just blame it on Pakistan as usual. CIA created the taliban in the first place and now after Pakistan has cleared its own country of this mess, they have to take the blame for the USA’s failure in afghanistan as well. All I ever read is the US created the Taliban, the US created IS, BLAH, BLAH, BLAH!!!!. Everybody is such an expert on counterterrorism and jihad. You guys need to back up your slander, and when you make an accusation as such you have to know what you are talking about, not just saying “the US created the Taliban” the Taliban was not created by the US, there was a time period where they were at war with an enemy of ours so we used them in a way to not get directly involved in a full scale nuclear war, it’s was actually a very wise and Tatical decision that most of you would have jumped into ww3 if it was you making the decisions Stop the blame game, it gets nothing accomplished and you sound foolish.